Agriculture is a key sector in the region’s economy and it employs an important proportion of the economically active population. Climate change could adversely affect Latin American agricultural regions, especially tropical Latin America, by reducing the amount of land available for cultivation due to increased risk of desertification, and by decreasing yields, especially on rain fed lands due to changes in climatic patterns. 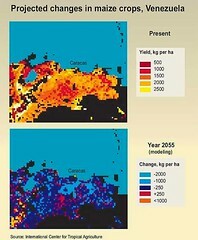 The dry land in the northern part of Venezuela is a major maize-producing area. 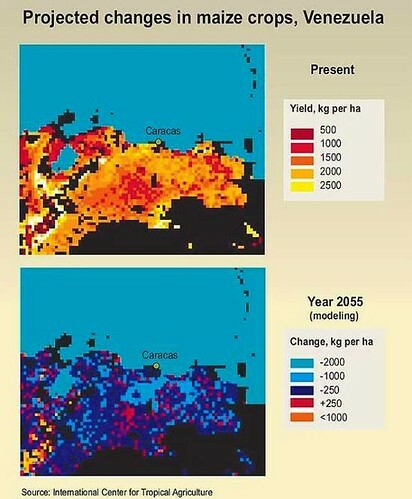 The change in precipitation and wind patterns could bring much drier climate and rain fed agricultural crops like maize could experience a major shift in productivity. In Mexico, any shift toward warmer, drier conditions could bring nutritional and economic disaster because agriculture already is stressed by low and variable rainfall.